I’ve posted various Egypt links before, from back when I researched my Victorian RPG campaign Sultans of Steam, which involved both a visit to Sakkara and the book of Thoth. This trope got cross-fertilized into another campaign of mine and a couple of others. Anyway, here it is again! This entry was posted in Roleplaying on October 30, 2005 by Dotan Dimet. In the Transhuman Space game, there was a paragraph on the character sheet explaining my attitude towards AIs and other nonorganic life. The GM of the last game took each player outside to discuss their character’s motivations and personality – my own had a patronizing attitude towards humans. In a previous con, I played a Fading Suns game where my character was married to another character, and had a child somewhere off-screen. I find that this happens often – the GMs, wishing perhaps for more character interaction, give me all kinds of biographical or psychological details about my character that have no bearing on the game, or no chance to be manifested. Sometimes I suspect this comes from the characters belonging to someone in a home campaign – the Fading Suns thing felt like this. Sometimes, I guess, it’s just a GM breathing life into his characters when he imagines the game. To have a point of reference, I’m posting the characters from my Transahuman Space game here (PDF) (If you’re familiar with Phil Masters’ Personnel Files, you’ll see my team is based very closely on his EDI mercenary team, although mine are probably more cinematic). For another point of reference, you might want to look at the characters Shiffer posted from his game (unlike him, I didn’t bother to provide stats). Sometimes I used to write character sheets that were 1-2 pages long, and each one of them was a bit of a story; I wasn’t satisfied to write, say, “Samurai Biker Chick” on the sheet, I would write “the Secret Origin of Samurai Biker Chick”. My Feng Shui characters (Hebrew, Word) are probably the most extreme example of this. Why did I do it? yeah, writing characters is something I only got to do for con games. So making each someone that I would find cool to play was fun, and writing each character’s background was my way to have fun with the character. However, most of the stuff on the character sheet was there for my own enjoyment, and I felt it just overloaded the players with too much unneeded information. So I write the same sort of stuff, only in much shorter form. Or, alternatively, I let the players come up with characters on the spot, just providing a few details and playing that. But where’s my fun there…? Of course, my real sin is writing the characters without writing the adventure; I usually finish the characters really late (I wrote the last three Transhuman Space characters in the morning at the con), and improvise the actual adventure from various bits of ideas I had. Actually sitting down and writing the plot, NPCs and encounters in as much detail as I write the characters will probably give me ways to make use of the characters’ backgrounds properly, and not just leave them lying about. Ideally, I guess a con adventure should be one where every word on the character sheet either helps the players roleplay the situations presented in the game or gives them a clue or a hook into the plot, or something the GM can use to spotlight their character later. Unfortunately, I haven’t written a game in a very very long while, certainly not at the level of detail of my first D&D dungeon adventures. It would be interesting perhaps finding a way to write a game that was as enjoyable as writing characters. This entry was posted in long, Roleplaying on October 30, 2005 by Dotan Dimet. 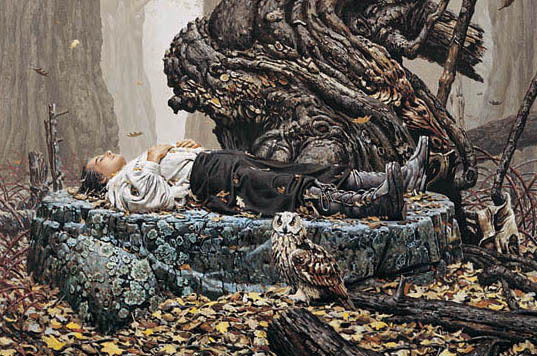 Keith Parkinson, fantasy artist, died of complications from leukemia on October 26, four days after his 47th birthday. Parkinson was one of the most impressive artists working at TSR, and did some very pretty covers for Dragon magazine and Dungeons & Dragons books, which etched themselves subliminally into my growing gamer brain. I spent an evening with Aya once going over her “Art of Dungeons & Dragons” book while she talked about the different artists, their skills and technical shortcomings, and what the paintings meant for her as a gamer and an artist. This work, a lot of it journeyman efforts by young and still developing artists, talented but sometimes technically limited, really means something to the kids who consume it: the chicks in chainmail, the hooded and cloaked knights, the dragons, the dark forests and campfires, the distant mountains on the horizon – these are the things and places where we were escaping to in our heads. This entry was posted in Roleplaying, Science Fiction and Fantasy on October 29, 2005 by Dotan Dimet. Prof. Jack Cohen (alien designer to the stars, co-author of The Science of Discworld and other books) is giving an lecture at the Weizmann institute tomorrow this morning at 11:00; if you can follow a very smart Brit talking very fast about science, it’s worth coming to hear him. This entry was posted in Blather, long, Resources, Science Fiction and Fantasy on October 27, 2005 by Dotan Dimet. This entry was posted in Software and Programming on October 24, 2005 by Dotan Dimet.